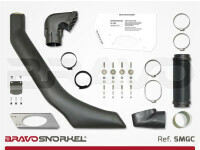 The snorkel is an essential accessory for every off-road vehicle. 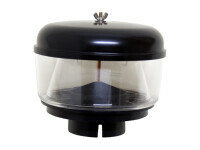 It allows your vehicle to go through deep river crossings without any damages on the engine. 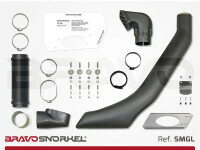 The snorkel protects the the engine from water and dust. 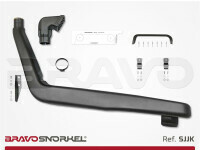 It's robust, UV durable, and fits perfect to your offroad vehicle. Please mind that models year 1995 and later my require to relocate the windshield wiper tank. 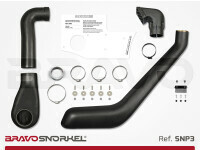 Please assure a proper installation of the snorkel assembly on your vehicle! It's essential that all connections are water tight to protect the engine from water. 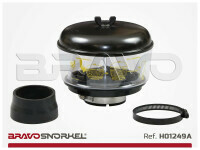 Mushroom head for snorkels 3"
Cyclone air filter Donaldson 186 mm / 3"+3,5"